An important output from factor analysis is the factor matrix, also called thefactor pattern matrix. 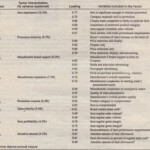 The factor matrix contains the coefficients used to express the standardized variables in terms of the factors. These coefficients, the factor loadings, represent the correlations between the factors and the variables. A coefficient with a large absolute value indicates that the factor and the variable are closely related. 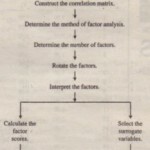 The coefficients of the factor matrix can be used to interpret the factors. Although the initial or unrotated factor matrix indicates the relationship between the factors and individual variables, it seldom results in factors that can be interpreted, because the factors are correlated with many variables. 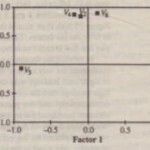 For example, in Table 19.3, under “Factor Matrix”, factor 1 is at least somewhat correlated with five of the six variables (an absolute value of factor loading greater than 0.3). 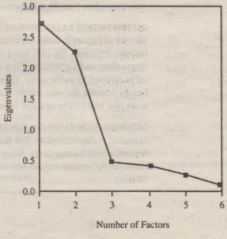 Likewise, factor 2 is at least somewhat correlated with four of the six variables. Moreover, variables 2 and S load at least somewhat on both the factors. This is illustrated in Figure 19.5(a). How should these factors be interpreted? In such a complex matrix it is difficult to interpret the factors. Therefore, through rotation, the factor matrix is transformed into a simpler one that is easier to interpret. The rotation is called orthogonal rotation if the axes are maintained at right angles. The most commonly used method for rotation is the varimax procedure. This is an orthogonal method of rotation that minimizes the number of variables with high loadings on a factor, thereby enhancing the interpretability of the factors.f Orthogonal rotation results in factors that are uncorrelated. The rotation is called oblique rotation when the axes are not maintained at right angles, and the factors are correlated. Sometimes, allowing for correlations among factors can simplify the factor pattern matrix. Oblique rotation should be used when factors in the population are likely to be strongly correlated. In Table 193, by comparing the varimax rotated factor matrix with the unrotated matrix (titled “Factor Matrix”), we can see how rotation achieves simplicity and enhances interpretability. Whereas five variables correlated with factor 1in the unrotated matrix, only variables VI’ V3, and Vs correlate with factor 1 after rotation. The remaining variables, V2, V4, and V6 ,correlate highly with factor 2. Furthermore, no variable correlates highly with both the factors. This can be seen clearly in Figure 19.5(b). The rotated factor matrix forms the basis for interpretation of the factors.